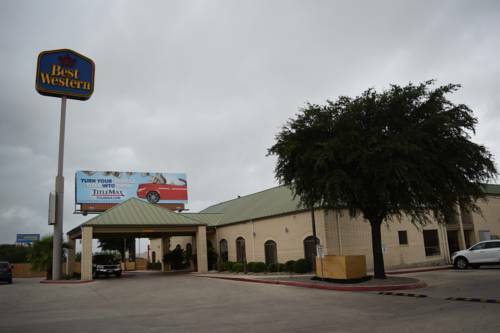 Welcome to the Best Western Ingram Park Inn located conveniently on Loop 410 short drive from the San Antonio Center. Guests in town find themselves conveniently close to everything, we are minutes from from you favorite local area destinations like SeaWorld San Antonio, Six Flags Fiesta Texas, and Downtown San Antonio Riverwalk. As a military-friendly hotel, a hot buffet breakfast is a must to start your morning on the right note. Indulge in hot waffles, a display of fresh fruits, your favorite morning pastries and endless 100% Arabica coffee. A cereal and yogurt bar completes the most important meal of the day. There's plenty of truck parking at our San Antonio hotel, making us a favorite for truckers, campers and those with bigger rigs. Centrally located to San Antonio attractions, you'll find commutes quick and easy, whether you're heading to famous barbeque joints or a business meeting. Nothing beats a morning at SeaWorld followed by a trip to the National Shooting Complex or Northside Stadium. Need recommendations? Our friendly staff is always available to help. Southern hospitality is our specialty, whether you're here for the Fiesta Texas or for a meeting at the Southwest Research Center. Employees of Citicorp and workers with the Texas Biomedical Research Institute are just a few of our regular guests. At our San Antonio hotel, everyone from families on vacations to road trippers and corporate executives prefer to stay with us for the comfort, top amenities and competitive rates. Lackland Air Force Base is a short drive away, and some fantastic shopping is nearly at your doorstep. However, if you prefer to relax, know that our luxurious bedding and cool, quiet rooms are always guaranteed. You'll be treated like part of the family here, complete with home cooked breakfasts and helpful staff. Book your next stay at Best Western Ingram Park Inn today! Enjoy your stay. ~41 miles from San Antonio.